Another weekend, another bloggers meet up here in the North East. 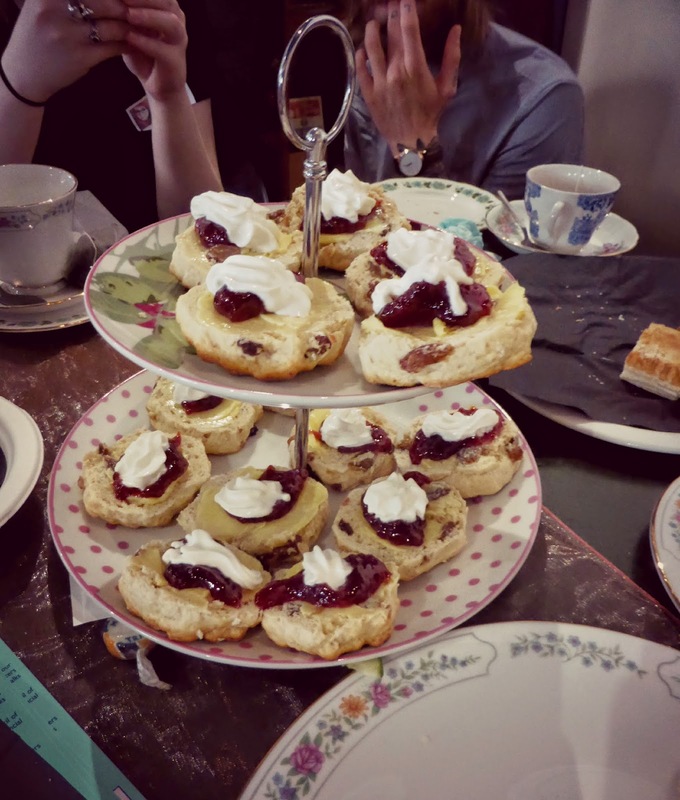 This time our meet was in the form of a tea party hosted by the lovely Rachel and Becca. They decided to hold the event on World Lupus Day so we could raise some money for Lupus UK. Rachel herself suffers from Lupus and before meeting her it was a disease that I had no knowledge of. Lupus is a chronic illness that attacks the immune system, its symptoms are very varied which makes it hard to diagnose so raising awareness is very important. My little sister was diagnosed with a chronic illness at a very young age, and it was a pretty confusing and frightening time so I know a little about what life for Rachel is like, and having the opportunity to support a charity like Lupus UK was fantastic. If you want to know more about living with Lupus then have a little read of Rachel's blog entry here where she explains things far better than I ever could! I started my day by meeting Kayleigh who writes a lifestyle blog based in the North East, I've been enjoying her blog for a while so it was great to meet her in person. We had a fun little jaunt round Eldon Square finishing in Fenwick discussing our favourite designer handbags and wishing we had the money to make a purchase. Kayleigh was so great to chat to and just as lovely in the flesh as she is in her blog so I think I've found myself another cake buddy. We were soon joined by my partner in blogging crime Lisa and we headed to Café Salsa to find the other bloggers. Café Salsa is a tapas café and bar in the centre of Newcastle, and yet another first for me. My nose was particularly taken with the place as soon as I walked through the door so I will definitely be returning to try out the hot food and I'm particularly happy that they are a "nut free zone" which is something I've never seen before. For this visit we were straight through the restaurant and up some stairs to our own little room. It's been a while since I've seen so many bloggers in one place and it was a really popular event, we were slightly early but the room was already full of people. 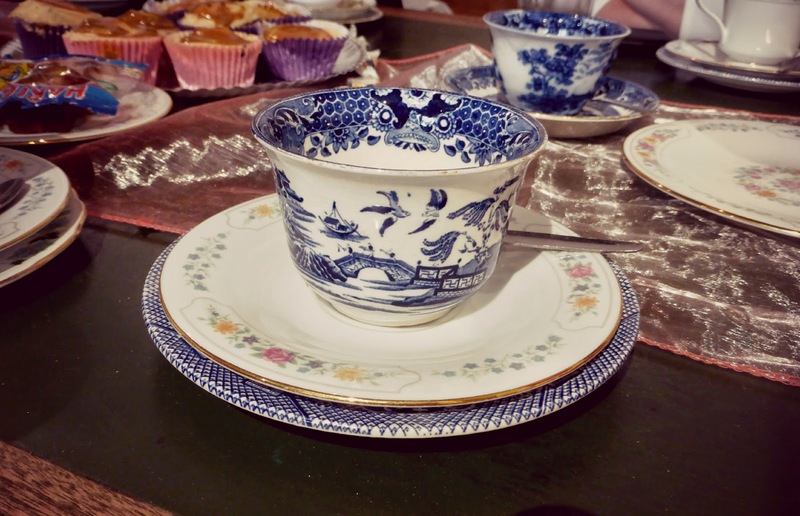 The tables were pre-laid with beautiful crockery and cupcakes so we picked one and settled down for the afternoon. We were soon joined by Helen from Hays Travel who were sponsoring the event, Emma who writes my favourite new blog find of the event and Claire who has the most gorgeous pink hair that I could only ever dream of pulling off. We had a fantastic afternoon discussing everything from button collections (yes ... seriously) to blog layouts and trying to explain to Helen the wonderful world of blogging and introducing her to Primark hauls. To complete our tea party a mountain of food kept arriving throughout the afternoon and we enjoyed sausage rolls, little sandwiches, sausages and slices of cake all washed down with Teapigs tea. I think this was the first bloggers event where I felt truly comfortable and not in the least bit scared, I was amongst friends and all of the strangers didn't seem as scary as they had done at my first few events. It was so lovely to walk into the room and get a few waves off people and for people to say "Hi Chloe". Unfortunately I didn't get to speak to a lot of people and missed out chatting to quite a few people. In fact at the end of the event when I went to go and find Dannii, one of my favourite local bloggers who I was yet to meet, she'd vanished. So I ended up using Twitter to find her and then going on a mission through Eldon Square after the event to catch her to say hello. As usual everything was over too quickly, I didn't get to speak to everyone but I left having discovered a few new blogs, meeting some lovely people ooooh and I got myself a rather nice goodie bag courtesy of the Metrocentre which was full of some lovely things including a £25 voucher from Hays which I'm going to use to convince Simon we need a trip to Paris early next year. If you're a blogger here in the North East and want to come to an event, the next one is being organised by Dannii and Kloe on Sunday 1 June in Middlesbrough. 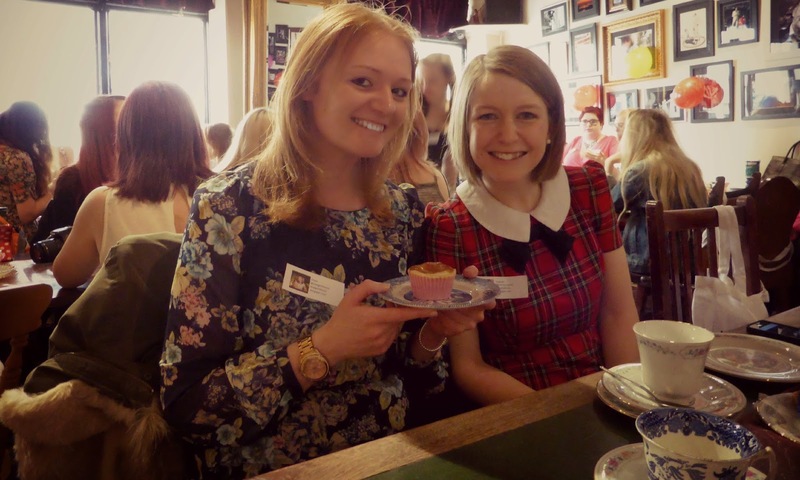 You'll get to meet some lovely likeminded bloggers and eat cake! For more information head here and hopefully I'll see you there! Cake looks yum and crockery is gorgeous! I've just emailed about the M'bro event....nervous!!! I had to miss it cos of work :( I'm even more gutted I'm missing FCUK next week ... grrrrrr at my busy diary! WOOOOOOOOOOOOO!!!!!!!! As soon as my diary quietens down we're going on a cake date! Great post and looks like a successful event, especially one for such a good cause. Of course you can :) I always describe myself as an honorary Geordie! Thank you for putting on such a great event!